With their internationally-renowned Chicago-style deep-dish pizzas which are found everywhere from small local restaurants in the city to commercial supermarkets half way across the world and their infamous hot dogs which are made my street vendors found on almost every corner throughout the city, Chicago opens up a world of flavour to curious visitors, miles away from the fast food that many of us tend to associate with America. With a name like “Chicago”, the city was destined to be known for food. Whilst no one is 100% sure of the etymology, the Chicago History Museum claims that the city’s name originates from the American Indian word “Chicagaoua”, which referred to a small onion or garlic-like weed which flourished around Lake Michigan at the time. So even before residents began whipping up all sorts of tempting ethnically-influenced recipes that would later see the city become a Mecca for foodies, it was already intertwined with food. Chicago has a strong connection with food from all over the world. Between 1880 and 1900, thousands of people from all across Southern, Central and Eastern Europe left their home countries and travelled to Chicago to start a new life, bringing with them their local recipes and cooking methods which they continued to use in their new homes. It’s thanks to this that today the Windy City lays claim to a number of regional speciality cuisines, each of which strongly reflects the city’s ethnic and working roots. 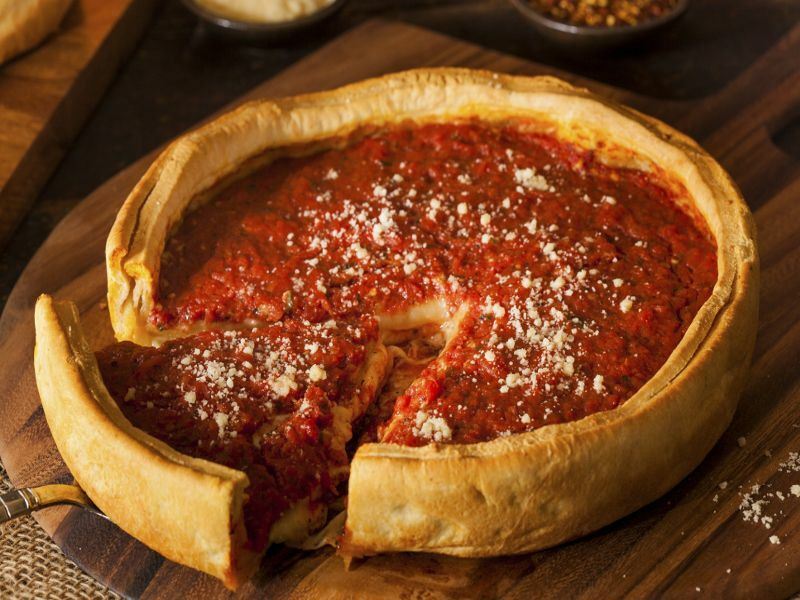 The popular Chicago-style deep-dish pizza is probably the most well-known local speciality and is very different from the traditional Italian pizza. This variation of pizza is more similar to a pie in shape, with a thick bowl-like crust, and uses a lot more ingredients – in terms of quantity and variety. The crust is layered with cheese first, followed by the toppings and finally the sauce – the complete opposite way ingredients are put together on a typical Italian pizza. The Chicago stuffed pizza is believed to have been created by brothers Efren and Joseph Boglioin – the founders ofGiordano’s restaurant. This type of pizza is very similar to the Chicago-style deep-dish pizza with only one main difference – the Chicago stuffed pizza has two crusts. The first crust is shaped into a pie-shape and topped with cheese, just like the deep-dish pizza. The cheese is then topped with a second crust before the additional toppings are added and the entire thing is smothered with sauce and more cheese. The Chicago-style thin-crust pizza is probably the least known pizza, despite its popularity throughout pizzerias and restaurants across the city. This pizza is world’s away from the from the deep-dish and stuffed pizza styles and is baked flat like a traditional pizza, instead of in a pie shape. The crust on this pizza is thin so that it has a crunch to it, but thick enough to be able to hold toppings. Unlike regular pizzas which are cut into triangular slices, Chicago-style thin-crust pizzas are sliced into 8-10cm-sized squares. After pizzas, the delicious Chicago hot dog is the second most well-known local dish in the state. This tasty dish is made of an all-beef frankfurter which is tucked into a poppy seed bun, topped with yellow mustard, chopped white raw onion, neon-green sweet pickle relish, a dill pickle spear, tomato slices, pickled sport peppers and a sprinkling of celery salt. With so many toppings stuffed into one bun, this hot dog is often described as looking like it’s been “dragged through the garden”. The Chicago hot dog is most commonly served from street vendors, some of which prefer to serve their frankfurter steamed, some of which prefer water-simmered and some of which prefer it grilled over charcoal. Whilst cooking methods vary from stall to stall, one thing all stall holders agree on is that tomato ketchup is totally unacceptable. Some hot dog vendors don’t even have it as an option! The Chicago Italian beef has got to be one of the best sandwiches in the whole of the US. This hearty dish is made up of thin slices of roast beef, smothered in a gravy-like sauce the meat was cooked in and tucked into a long Italian-style roll. The entire sandwich is then dipped – sometimes double-dipped – into the beef juices, before it’s finally topped with sautéed green Italian peppers. You’ll find this sandwich served alongside Chicago hot dogs at most hot dog stands throughout the state, as well as in numerous local Chicagoan restaurants. Many venues also offer a “cheesy beef” option, which sees the sandwich finished off with a slice of provolone or mozzarella cheese. Some stands also offer a “combo” option which includes the addition of grilled Italian sausage, as well as the roast beef. This delicious sausage has origins in Maxwell Street Market District in Chicago, where it was created in 1939 by Jimmy Stefanovic, a Macedonian immigrant. A Chicago Maxwell Street Polish sausage is made up of a fried or grilled length of Polish sausage which is topped with grilled onions and yellow mustard, all served up in a bun. Sport peppers are sometimes added on top, too. You’ll find Chicago Maxwell Street Polish sausages served up alongside Chicago hot dogs and Italian Beef from street vendors, as well as from traditional Chicagoan restaurants in the city. Although not quite as internationally-renowned as the pizzas and hot dogs, chicken vesuvio is without a doubt one of Chicago’s best speciality dishes. This Italian-American delicacy is comprised of chicken served on the bone alongside potato wedges, celery and carrots. The whole dish is sautéed with oregano, garlic, white wine and olive oil before it’s baked in the oven until the chicken skin is golden and crispy. Peas are sometimes added before serving to add a pop of colour. Since this dish requires so much prep and the use of an oven, it’s not often found from street vendors, but it’s commonly available in traditional restaurants throughout the city. As well as the typical chicken-based version, many restaurants also offer other variations with different types of meat, including steak and pork. The definitive origins of the dish are unknown, but most people believe that chicken vesuvio gained its immense popularity by being served at the Vesuvio restaurant throughout the 1930’s. Each summer, the Taste of Chicago food festival – locally known as the Taste – is held in mid-July in Grant Park, Chicago. This foodie affair is the largest festival in the city and regularly attracts around 3-4 million visitors, each of which travels to the park for the opportunity to wander around the 70+ food stalls and pop-up restaurants, together offering a gastronomic melting pot of local and ethnic delights. Some of the most popular dishes at this annual event include the infamous Chicago-style deep-dish pizza, Chicago hot dogs, Italian beef sandwiches, barbecued ribs, Eli’s cheesecake and the Maxwell Street Polish sausage. If you make the dough from scratch, this recipe takes around two hours from start to finish. If you skip the dough-making process and buy pre-made Chicago-style pizza dough, you’ll be able to whip up this recipe in about an hour. The long list of ingredients and recipe steps might look intimidating at a first glance, but the recipe is fairly easy to prepare and the end result definitely makes it worth the effort. The recipe makes one large pizza, big enough to serve four people as part of a main meal.